Soybeans are cultured and fermented in a controlled environment and this process binds the beans into a cake. Rich source of cheap protein. Making my own tempeh is another one of the projects that have been on my list for a few years now and finally, I’ve gotten a chance to do it. Tempeh is considered a “street food” in Indonesia. It wasn’t popular outside Indonesia before. It’s sold at the market and considered a very cheap source of protein. Nowadays though, with its popularity as a good source of non-animal protein, the word tempeh is not so alien anymore in the Western hemisphere. There is instruction comes with the tempeh starter that I purchased, but I modified the instruction a little bit. I don’t have any special equipment. Just the oven. If you are in a warm tropical country (like the temperature in Indonesia at the upper 80s to mid-90s), there’s no need for an oven. It’s warm enough as it is. I got my tempeh starter from Cultures of Health and one packet is good for 2 cups of soy beans and so that's the amount I used. Spread two to three dry clean absorbent cloth on the kitchen counter or wherever with enough space. Spread the cooked beans on the cloth and use the towel to gently rub the beans to dry it. The beans will slowly cool down, but don't let them turn cold. It should be about body temperature or slightly warmer. How do I maintain the warmth ? I turn on the light inside the oven (figured that out by accident) and it magically help me maintained the temperature inside the oven around 90. Nothing will happen for the first 24 hours in my case. Some shows result starting at 20 hours. Mine started to grow rapidly after 30 hours. The tempeh is done when it covers with white spores all over and you can pick it up like a block without it breaking apart. It should be firm. Freeze it if you are not going to cook it in a week time. It's good up to 6 months in the freezer and about 1 week in the refrigerator. 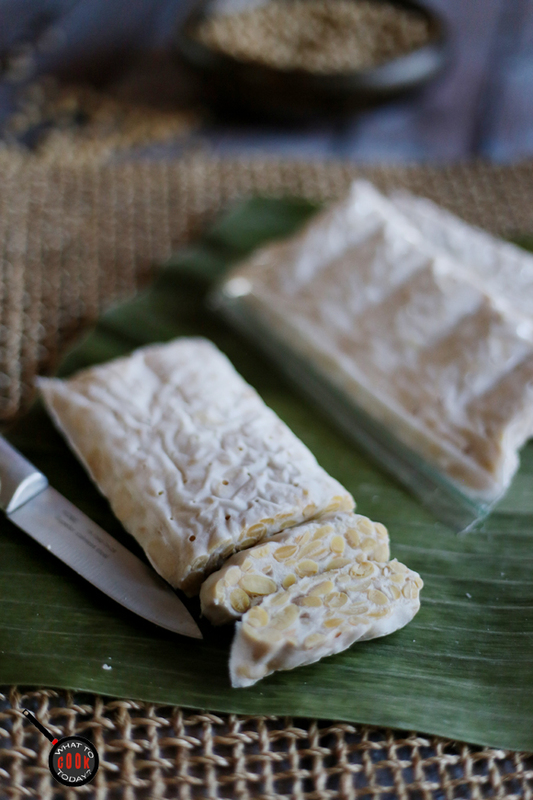 If during the process, the spores turn black and the tempeh is soft, you need to discard it. Those have some toxins.